You are what you eat. Heard that one before? Lately, i’ve been feeling sluggish, been drinking too much – one could say i’ve been partying too hard and my skin, has seen better days. You hear about these diets all the time, people on it and the ‘magical’ things it can do for you. Diets are scary, the thought of not having your favourite foods for a certain period of time is indeed a daunting thought. Finally, after a LOT of encouragement from Mr.X i’ve decided to embark on this raw food journey with him, for a week. A week, not a long time right? I definitely know I need a detox, shred some extra weight here and there and just improve my general wellbeing. My first thoughts were that maybe this will be easier since i’m dating a vegetarian. My diet has been very vegetarian based as of late as i’m trying to consider Mr.X’s non-meat diet. It’s great, I never knew how one could be so creative with vegetables. Curries from scratch & big meals sans meat. Absolutely mind blowing sometimes and definitely a big learning curve for me. Back to raw food. What is it all about? When heating food a lot of nutrients are destroyed and of course, natural enzymes. This is bad because enzymes is EXACTLY what boosts your digestion and fights off chronic diseases. Simple, if you’re cooking it, you’re killing it. Apparently you can lose weight on this diet for obvious reasons. Most raw foods are low in calories, sodium, fat and high in fibre (think bananas). Also, great for your skin! Especially for those with problem skin, like mine. What can you eat on this diet? Think unprocessed, uncooked and organic if you can. Main staples will include the obvious raw fruit, vegetables, nuts and seeds. If you’re game, raw eggs. Don’t worry, studies have found that its 1 in 10,000 eggs that will be contaminated with salmonella. Simple though- buy organic eggs. Your kitchen will need to have a blender, food processor and even a dehydrator. I don’t own a dehydrator so an oven can substitute for this. I’m trying to be as creative as I can possibly be on this raw food journey. I’ve been told that some people are lazy and just blend juices for three meals a day. I couldn’t do that, it has to look enticing and tasty especially if i’m going to be deprived from cooked foods altogether. Day 1 started on a Saturday night. I refused to start this in the morning as I was severely hungover from a Mexican/Tequila party we had hosted the night before. I felt like death. Definitely time for a detox! 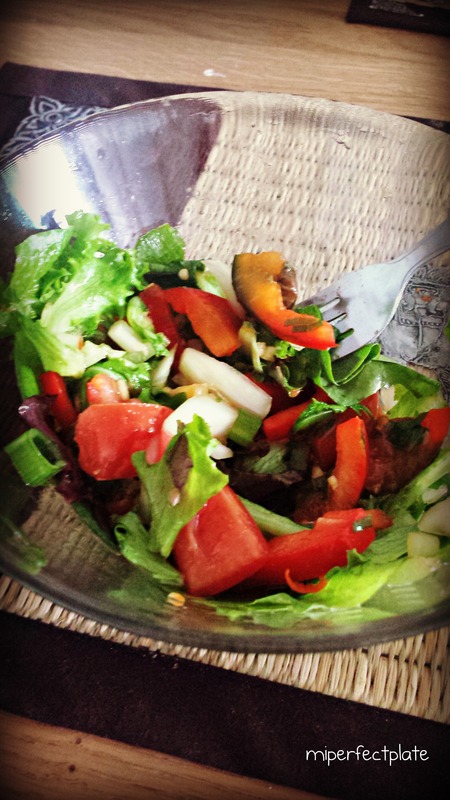 This salad was just a handful of fresh mixed greens, radishes (my favourite veggie), carrots, red capsicum, cucumber and tomatoes. The dressing was, two raw eggs, lemon juice, chillies, pepper, salt and assorted spices that we picked by random from the spice drawer. We had two coconuts to drink and then yes, we had an early night. Sunday morning! Mr.X made us a smoothie with cucumbers, mandarins, paw paw, passion fruit, chia seed and macca powder. Was feeling quite full after this and wasn’t craving my usual breakfast carbs. Winning! When lunch time rolled by, he prepared us an Asian inspired salad. Again, assorted leafy greens, red capsicum, onion, shallots with a dressing of raw egg yolk, ginger, soy sauce and sesame oil. Really delicious and filling. Dinner is where we finally got creative! 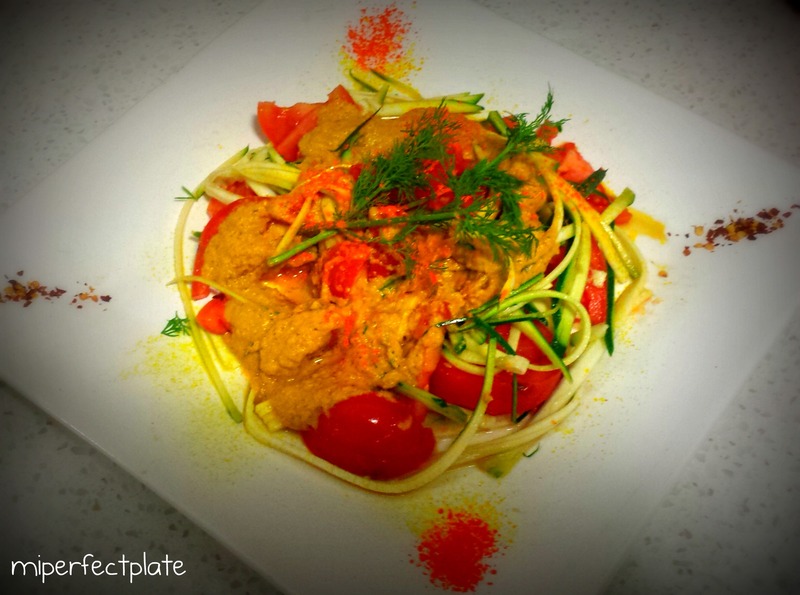 I had been browsing recipes earlier on in the day and thought the idea of raw zucchini pasta with creamy carrot dill sauce sounded like a great choice. You’re going to need a good quality blender for this recipe! 1) In a blender, combine all the sauce ingredients and blend until smooth. If you find that it’s too thick, just add water. 2) Julienne the zucchinis until they are thinned (look like pasta) and chop up the tomatoes. 3) Pour the sauce over the zucchini, tomatoes, in a large bowl and toss. *add salt & pepper to taste. Never in my wildest food dreams would I have imagined that something so raw could taste so good. I don’t even like zucchini usually. It doesn’t end here! We also prepared a salad. You’re thinking, salad…again? There is a special element to it. 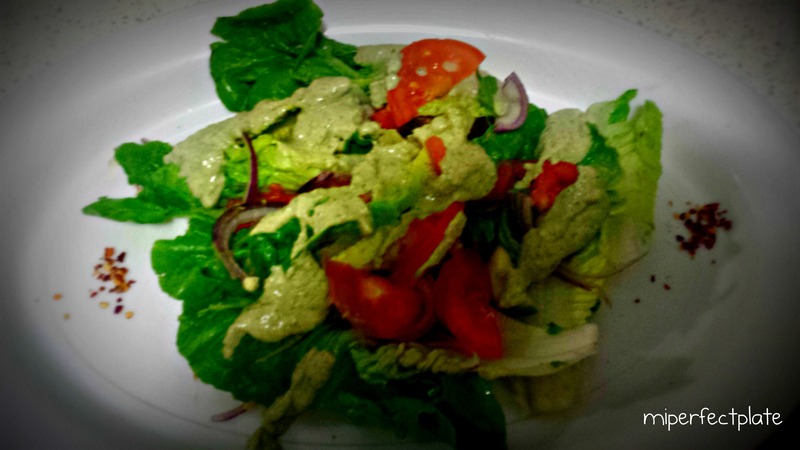 The raw caesar dressing was absolutely divine! My housemate had a bunch of friends over for dinner and they all tasted it and thought it was brilliant too. I put all the above ingredients into a mixing bowl and blended using my stick blender. The outcome was so smooth and creamy. Please excuse the blurry picture below, I was too excited to start eating. Monday, the best day of the week (not)! Had another fruit and cucumber packed smoothie for breakfast. Felt slightly scared going into uni surrounded by friends asking me to have lunch with them and drinks at UQ’s Red Room. Had to turn them down politely and describe the raw food diet to them. Most of them thought I had lost my mind and the others just laughed because i’m always doing different things to myself and can’t quite understand why. So as we walked to our tutorial, I snacked on two bananas and that was that! A few hours later at home, I started to get slightly hungry and didn’t feel like having another banana. Guacamole! 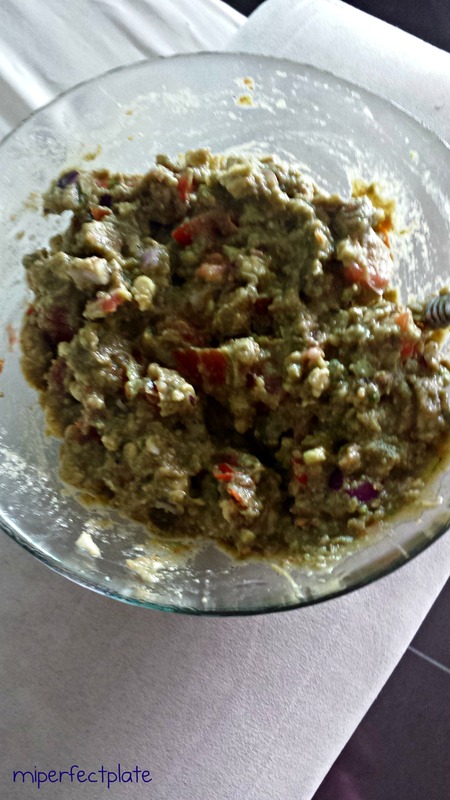 Wonderful green spicy and zesty guacamole! It hit me that this delicious Mexican snack is indeed RAW! In a haste I chopped up a Spanish onion, garlic, chilli and mashed up two avocados with lemon juice, salt & pepper to taste. Didn’t even bother cutting up carrots or cucumbers to go with it, just ate it by the spoonful. It’s so simple and so tasty. The picture is rather unappealing but I can assure you, it’s really good. Loving my Asian food on almost a daily basis, I started to have a really strong craving for some. I decided that we’d have a raw pho for dinner. Did you just re read that? Yes, raw pho is actually possible! This recipe takes slightly more effort as you have to soak dried shitake and other assorted Asian mushrooms for 6 hours beforehand to create the broth. 1) Soak the assorted mushrooms in warm water 6 hours before you plan to start preparing for dinner. I soaked mine in a bowl and covered it with a plate to ensure the flavours didn’t escape, or as posh people would say…’evaporate’. 2) Drain the mushrooms and set aside. You may heat the broth to 40 degrees on the stove. Add in the garlic chilli paste – which is simply finely chopped garlic, chilli and apple cider vinegar mixed together and soy sauce. 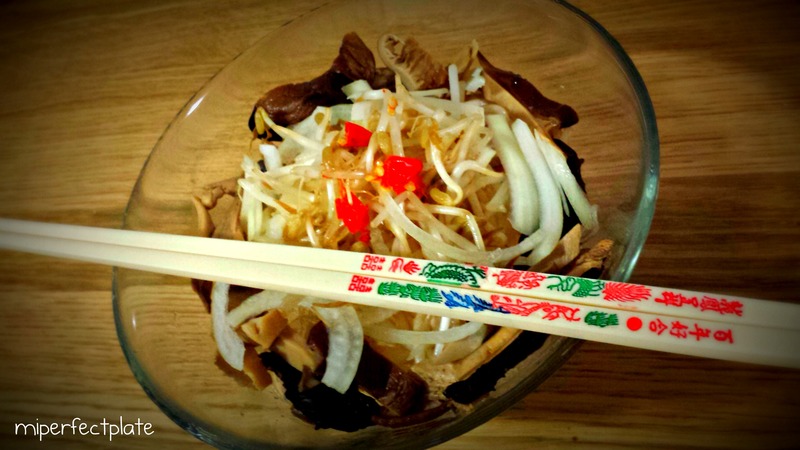 3) Dress a bowl with a handful of kelp noodles, bean sprouts and the mushrooms. 4) Add the broth into the bowl and more soy to taste (if you like your food salty like me!). This has been my favourite raw dinner so far. Even if you’re not following a raw food diet, this is definitely a recipe to try out. Also, kelp noodles = 0 carbs. Avoid buying kelp noodles from Flannerys. I initially bought it there and it cost me a whooping $11. Last night, we found kelp noodles at Hanaro Mart (Asian shop) for $1.60. Feeling super ripped off. 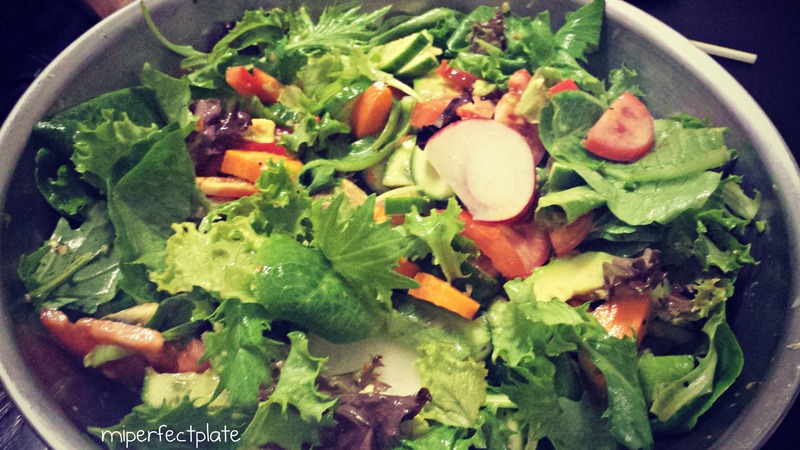 ← miperfectplate’s first catering gig!